As the temperature begins to fall and winter weather approaches, it is important to develop a plan for snow and ice removal on your property to prevent slip and fall accidents. In today’s fast-paced world we tend to forget how slippery snow-covered parking lots and walkways can be in the winter. Whether we’re dashing into the store to quickly grab some milk or leaving work to get a quick bite for lunch, stumbling upon untreated areas can be treacherous and lead to serious injuries. One of the many responsibilities of a business or property owner is to take reasonable care to maintain safe parking and walking areas for customers, employees and vendors. 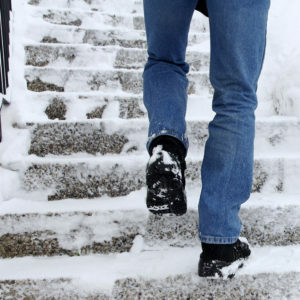 Here are a few ideas to help develop a plan so that you can prevent slip and fall injuries from occurring on your property. Prior to the onset of winter weather, take care of any trip hazards in parking lots and walkwayssuch as potholes, cracks or uneven surfaces. Inspect rain gutters and downspouts and repair any damage. Avoid having any water flow from these onto walkways where it could freeze and create slippery conditions. Hire a qualified contractor for snow removal and have a signed contract. The contract should list work responsibilities and expectations for snow removal and salt/sand surface treatment. Make sure to require proof of insurance and an ongoing log that documents work as it is completed throughout the season. If you or an employee will be responsible for snow removal or clearing walkways, have a plan to designate who is responsible, monitor conditions regularly and document each time areas are cleared or treated. When applicable, post signs warning of falling snow and ice. Signage should also be posted identifying wet floors in high traffic areas during winter months. Install and secure proper rugs or floor mats in entryways to prevent slipping and to help absorb water. Have an Incident Report easily accessible as one should be completed immediately following any slip or fall on the premises.